We are delighted to share all of the fun and exciting things that have been happening at IGC over the last several months, as well as what we are most looking forward to! We are currently gearing up for our annual Thanksgiving Clinic at IGC, which will be taking place Friday, November 24th, and Saturday, November 25th. 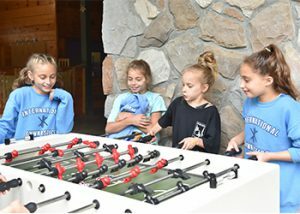 At our Thanksgiving Clinic, campers will partake in premier gymnastics training, as well as traditional recreation activities and games. 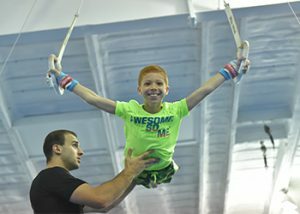 The two-day clinic is a small taste of what an IGC summer camp experience is like. Since summer has come to a close, IGC has been undergoing a couple of renovations and updates. The most noticeable change is the walkway in front of the Museum and Bear’s Den. 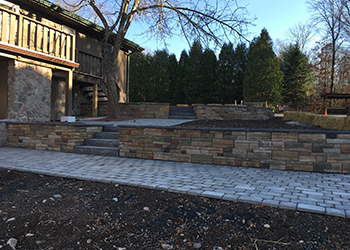 That area was filled with decorative red stones, but it is now being replaced with paver stones, pergola, and trellises for flowers to climb. Another big change is near one of our staff houses. There is now a beautiful path and stone wall that leads up to the front entry way. One of the projects we have been working very hard on is our newly-designed IGC brochure. 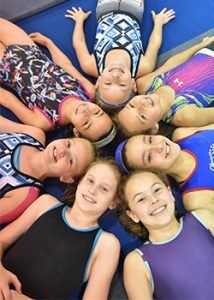 Our brochure is chock-full of important information in regards to IGC, including Summer 2018 camp dates and registration, training in our gyms, dining and nutrition, IGC initiatives, and much more. In addition, our brochure includes amazing photos that embodies the essence of summer camp, gymnastics, and fun. The photos give you an inside look into all five of our world-class gyms, recreational games and activities, and the amazing celebrities who have visited IGC. Each of the photos of our celebrities on the front and back covers were specially designed with a UV Spot Coat, which gives it a unique glossy and shiny appearance. We are so happy with how our brochure turned out and hope you enjoy looking through it. You can find a link to the pdf by clicking here. Another project we are extremely thrilled about is our new promotional video. During Week 11 of summer camp, we had a film crew here capturing our campers, staff, and the overall beauty of camp. The video looks incredible so far and we cannot wait to share it with you all! It should be completed by the end of this year, so be on the lookout for that. Summer 2018 will be here before we know it and we couldn’t be more excited! Make sure to check back right here on our official IGC blog and social media pages for more information and updates.